The unique, lightweight curved Cross Breeze™ frame system pack from Outdoor Products keeps your back cool while supporting heavy loads by using suspended mesh for maximum airflow. The padded, ergonomically designed waist belt comfortably supports those loads, and articulated, yoke-style shoulder straps with sliding sternum adjusters make for an agreeable ride. Four multi-sized primary pockets will hold all your day-hiking gear including a handy front pocket for quick access to flat items like maps. The roomy interior pocket fits most 2 Liter reservoirs (not included), and the middle pocket is compartmentalized to aid in sorting those hard-to-find items. If you prefer carrying bottled water, two side mesh pockets will fill the bill. Disclosure: The MM Brand Agency contacted me to try Outdoor Product’s Cross Breeze pack at no cost to me. My only responsibility was an agreement to complete this review after trying the item. I was not pressured in any way to make a positive endorsement. small, outer-zip pocket for insect repellent, sun screen, first aid, etc. 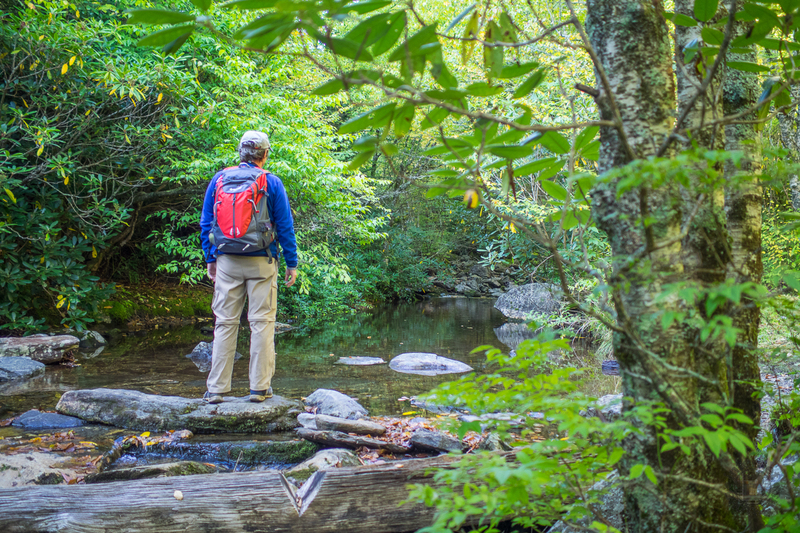 That’s quite a list of features, and they all come in handy when you’re packing for a hike. When stowing gear in the Cross Breeze for the first time, I was presented with lots of options. I put my bug repellent, sun screen, first aid, matches and other small items in the handy top pocket up next to my neck. My rolled up rain jacket and rain pants fit nicely in the roomy bottom of the main double-zipped pocket along with the water bladder. Outdoor Products advertises that it fits most 2-liter bladders. I found that I could fit a 3-liter bladder no problem. There is still room in this main pocket for an extra layer of clothes. On one hike I even stowed my water shoes here. In the smaller inner pocket I put my multi-tool and flashlight, a small towel, and some toilet paper. I loaded the handy individual compartments within this pocket with items like granola bars, jerky, space blacket, candle and additional first aid. There’s still plenty of room for a sandwich or two, or a pair of dry socks. There’s a clip hook in there for keys as well. In the flat outer pocket I keep my maps. Since I always use a hydration bladder for water, I don’t carry extra bottles, but the side pockets are ideal if that is your preference. Instead, I kept extra food in there to snack on while walking. There are even tiny mesh pockets in the waist belt that are useful for a compass or whistle, or perhaps some glove liners. At 31 liters in size, I found the pack to be plenty big enough to accommodate everything I wanted to take with me day hiking, with room to spare. This really isn’t a multi-day pack for section or thru-hikes, but is spacious enough to carry extra food, water and clothes for an overnight hike. So far, I have used the Cross Breeze on four hikes, each in the 8-12 miles range. In all cases, I never wished I had more stuff with me. I knew as soon as I put the fully loaded Cross Breeze on for the first time that this is an extremely comfortable pack. There are plenty of adjustments you can make to fit your own comfort. There are compression straps on the suspended mesh frame and on the shoulder straps enabling you to tighten or loosen depending on the length of your torso. There are also compression straps on the waist belt to fit even the roundest of bellies or the flattest of tummies. Once you have the sizing tuned to your best fit, I think you will find that the Cross Breeze rides smooth and easy. Its lightweight, airy design balances equal load on your shoulders and hips so neither is carrying too much. In all the hiking I’ve done with this pack I’ve had no shoulder discomfort at all, unusual for me. The suspended mesh frame works perfectly keeping the bulk of the pack away from your back allowing air to pass between. This helps to prevent that unwanted perspiration on your back that is so common with frameless day packs. As such, it also keeps the contents of the pack dry. I have worn cheap packs on a hot summer day that were wet with my sweat even on the inside, and I’ve worn other suspended frame packs that didn’t work nearly as well as the Cross Breeze. Dry is better. 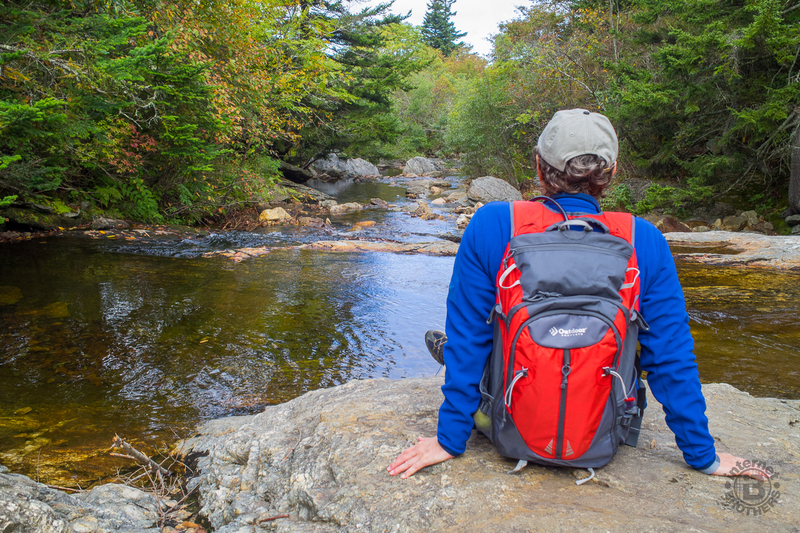 Frequently, with other packs I have used, when I pause for a breather or to sit down for a few, I remove the pack simply to take a load off. I noticed the other day that I had been leaving the Cross Breeze on. It is so comfortable to wear, that I haven’t found any need to remove it just to give my shoulders or back a break. 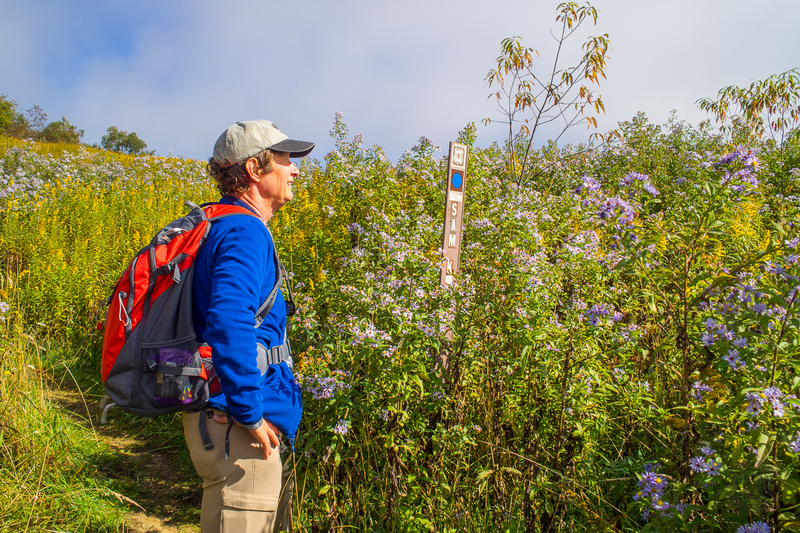 I haven’t been consciously thinking, “Boy I need a break just to take the pack off.” When you’re on a particularly long or difficult hike, the last thing you want to be thinking about is your shoes or your pack. Comfort is a definite plus for the Cross Breeze! Is There Anything I Don’t Like? Well, I really had to struggle to come up with anything. But there is one thing that is a little annoying. The hydration bladder fits way down low in the inner pocket. As such, the tube out of the bladder has to travel a long way to the front. Therefore, there wasn’t much length left to work with on the tube, so I was having to turn my head to access the mouthpiece. But every problem has a solution, so after a little readjustment, I was able to make this better. I took the small towel I carry with me out of one of the other pockets and put it in below the water bladder to prop it up higher on my back. This gave me more slack with the tube, and more comfortable access. Problem solved. So, my message to the designers at Outdoor Products would include the above comment about the water bladder and tube. Otherwise, I have nothing else to complain about. It packs easily with plenty of room. It is extremely comfortable to wear, and lightweight. It appears to be very well made. Obviously, time will tell, and I’ve only had the Cross Breeze for a few weeks, but I expect this pack to last for years and years. It is quality workmanship. I highly recommend the Cross Breeze as a mid-size pack for day hiking usage. It is now my favorite pack and the first choice out of my gear closet. The Cross Breeze™ frame system pack from Outdoor Products comes in two colors: a royal blue and scarlet red. Each has dark grey accents. Dimensions are: 20.9 W x 12.2 H x 9.3 D / 1,362 cu. in. or 31L. At present, there is no information about retail pricing for the Cross Breeze pack, but as soon as I learn more I will pass it along to you. All photos of Meanderthal Jeff Clark wearing the Cross Breeze™ Frame Pack taken by Meanderthal Ken Miller.